your needs and help you to complete the lawn maintenance, house cleaning, shower, car wash, pet bath and other work. It is very light, easy to use and it is a good helper for your lawn irrigation, garden watering, roof cooling. material:The inner tube is a natural latex inner tube, the webbing is 3750D new high-strength polyester silk outer tube. *Drain your hose in the summer when you are not using it and keep it shaded as much as possible. remaining in the hose can freeze,damaging the hose. Do not stretch or expand this hose when it is empty. the garden hose is mtended to expand only when the water is rurned on. accidently released, it will quickly snap back and could cause personal injury. 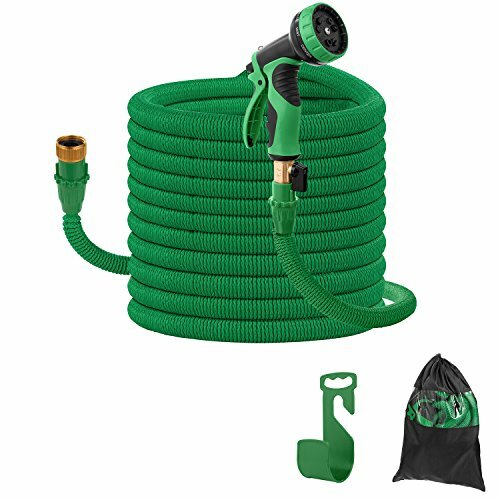 SAVE SPACE: The original length of this water hose is 17 feet and expands to 50 Feet with water pressure, but returns in seconds to 17 Feet after water is out.you can use the equipped hose clamp and drawstring bag to store. HIGH QUALITY:The pipe, nozzle,valve,brass connectors and spray are made with durable premium materials and fabric.They will not rust, leak or tear,Very durable. MULTI-PURPOSE: Use your hose to release a steady stream of water with 9 function spray nozzle, water your lawn, clean your house, clean your car, wash your pet dog, and more. HIGH PRESSURE-RESISTANCE: Camande water hose is built to work with a minimum water pressure of 43.5PSI (3 bars),and can safely operate with water pressure up to 145PSI (10Bar). SOLVE WATER LEAKAGE: The inner tube and the joint are connected by an active connection, and can be automatically locked by lightly loading, the ring is uniformly applied, the inner tube is durable, and the leakage of water is not likely to occur. If you have any questions about this product by Camande, contact us by completing and submitting the form below. If you are looking for a specif part number, please include it with your message.